100 % NATURAL & QUALITY. This handcrafted wine wall rack is made from quality hardwood – ash tree, which undergoes a process of deep drying. The surface is covered with a special protective coating, which makes the wood last longer and adds a nice color. The back side is finely sanded, therefore it doesn't scratch the wall. DISPLAY, ORGANIZE & STORE UP. This Wine Rack can hold 10 bottles of your favorite wine, without taking up floor space. Perfect for kitchens, dining rooms, bars, counter space, wine cellar, wine shops, café, restaurants etc. Dimensions: Length: 59 cm (23.2”), Width: 6 cm (2.4”), Depth: 9 cm (3.6”). CATCHING EYE DESIGN. It’s simple, functional and good-looking! This Hand-crafted Wine Rack will fit and complete a wide variety of décor. Ideal for both - new wine collectors and expert connoisseurs. HARDWARE IS INCLUDED. The Wine Rack comes ready to mount. Includes pre-drilled holes, 2 mounting screws and two pairs of dowels – for drywall and hard walls. BEST GIFT IDEA. PARTY SUPPLY. BEAUTIFULLY WRAPPED. Comes beautifully wrapped in craft paper. This Wine Rack makes an attractive & practical gift for Wedding, Holidays, Thanksgiving Day, Housewarming, Birthday, Engagement party, Christmas, Gift for Her, Gift for Him, Anniversary, Wine Party or other special days! This handcrafted wine wall rack is made of high-quality 100% solid wood-Ash Tree, which has been previously fully dried, which ensures a long life of the wooden product. The surface is covered with a special oil-based protective agent that prolongs the service of the wood and imparts a beautiful color to the Ebony tree, preserving the unique structure of the ash tree. The reverse side is smoothly sanded, so it does not scratch the wall. The Wine Rack comes ready to mount, hardware is included! Packing: The Wine Rack with pre-drilled holes, 2 mounting screws, two pairs of dowels for drywall and hard walls, 2 wooden caps. This Wine Rack can hold 10 bottles of your favorite wine, without taking up floor space. Perfect for kitchens, dining rooms, bars, counter spaces, wine cellars, wine shops, cafés, restaurants etc. It's simple, functional and good-looking! This Hand-crafted Wine Rack will fit and complete a wide variety of décor. Ideal for both - new wine collectors and expert connoisseurs. Comes beautifully wrapped in craft paper. 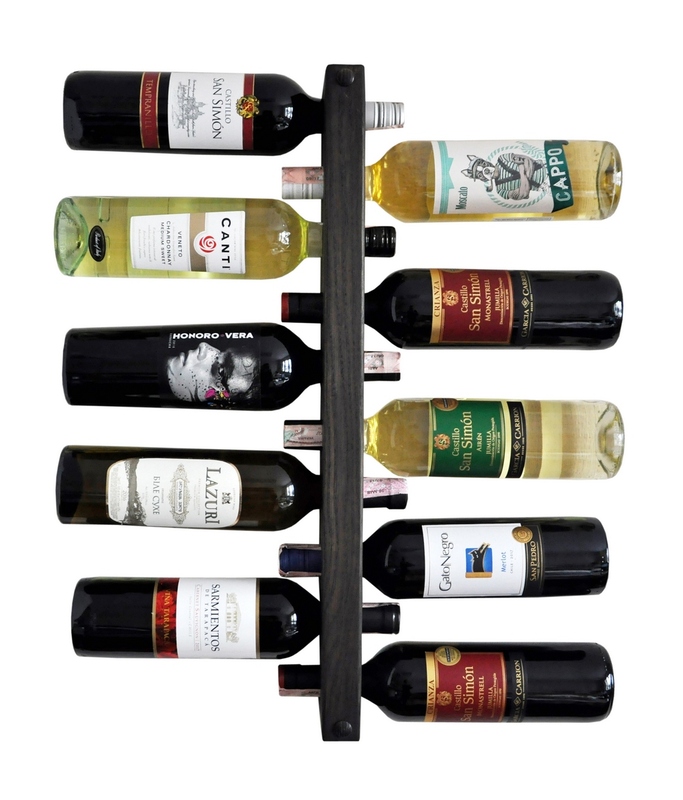 This Wine Rack makes an attractive and practical gift for Weddings, Holidays, Thanksgiving Day, Housewarming gift, Birthdays, Engagement parties, Christmas, Gift for Her, Gift for Him, Anniversary, Wine Party or other special days! Give your loved ones beautiful products and pleasant moments.